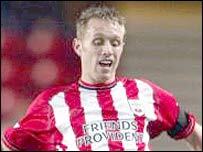 Wigan manager Paul Jewell has signed 28-year-old striker Brett Ormerod on a month's loan from Southampton. "He's a player I've admired for a long time and I've tried to sign him several times before but it's never quite worked out," said Jewell. "Brett has come on loan with a view to a permanent transfer." Jewell's side top the Championship but he had been frustrated previously in his attempts to sign a frontman to boost his side's promotion push.